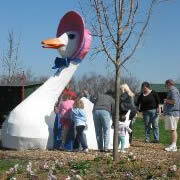 Once upon a time, there was a wonderful storybook park in Ellicott City, Maryland called The Enchanted Forest. Opened in August 1955, it thrilled and delighted generations of families from far and wide throughout the next 30 years. 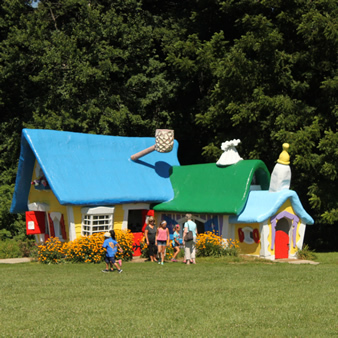 The Harrison family created this magical land to delight children of all ages and it was an important part of many families' lives for years. The imagination of the creators and the people who ran the park throughout the years made an indelible impression on generations of families. Sadly, it closed to the public in the early 1990s, leaving a void for all of us. In the summer of 2004, we were able to obtain the very large and orange Cinderella Pumpkin Coach and display it at the farm. It was a big hit! It was so much fun to see the faces of parents and their children as they explored the magic of the Cinderella pumpkin coach. We thought how wonderful it would be to have the other items from the Enchanted Forest and be able to share them with a new generation of families. The owner of the Enchanted Forest Shopping Center, Kimco Realty Corporation, very graciously agreed to give us the items as long as we made every effort to remove all of the items from the park. So we started the process of moving the items to the petting farm and restoring them to their former glory. In 2005 we moved and restored a number of items. These included Mother Goose and her Gosling, the Black Duck, the six Mice that pulled Cinderella's Pumpkin Coach, Papa Bear, the giant Mushrooms, the bell-shaped Flowers, two giant Lollipops, a number of Gingerbread Men, a large Candy Cane, the Little Red Schoolhouse, the Crooked House and the Crooked Man, the Easter Bunny's House, the Beanstalk with the Giant at the top and the beautiful Birthday Cake. We continued to work hard in 2006. 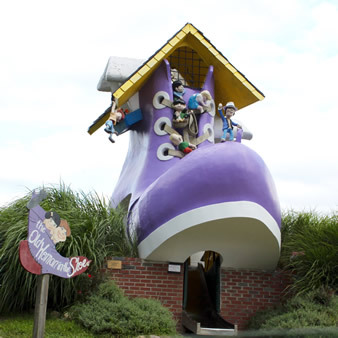 The two major projects of 2006 were moving and restoring the Old Woman's Shoe and the Three Bear's House. We had to cut the Old Woman's Shoe in half and put it on two separate trailers to get it down Centennial Lane under the telephone and electric wires. 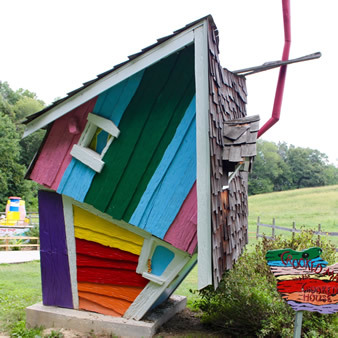 It is a short distance from the Enchanted Forest on Route 40 and Clark's Elioak Farm on Route 108, but every time we made the trip moving a major structure from the Enchanted Forest to the farm, it was an amazing adventure! We also had to cut the Three Bear's House in half to bring it to the farm. Then we put it back together with loving care and lots of work. All of these efforts were undertaken by some incredible friends: Marty Levine and Excel Tree Experts, Expert House Movers, and George Miller and his crew. 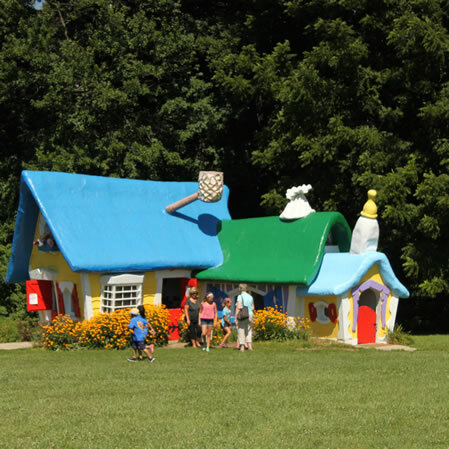 We restored Snow White, Sleeping Beauty, Robin Hood, the Three Little Pigs' straw, stick and brick houses, the Rainbow Bridge, and Little Boy Blue, the Old Woman's Shoe and the Three Bears House. We are also delighted to report that the Leonard Hartman family of Essex, Maryland has donated Little Toot to the farm. We really appreciate their generosity!!!! Help and support continued to arrive in 2007. 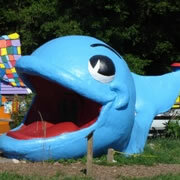 Mark Cline helped us restore Humpty Dumpty and Willie the Whale, and George Miller (along with his wife, Sharon) donated and built a beautiful wall for Humpty Dumpty. 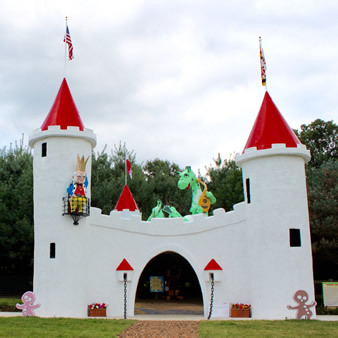 We also restored the Merry Miller's House and Little Toot and built a new white Enchanted Castle entrance for the farm. 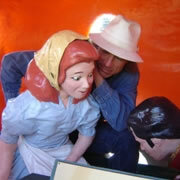 Our 2008 projects included repairing the Wishing Well, and the creation of the characters we needed to complete many of the Enchanted Forest attractions. We added over 22 characters, including a dragon and Rapunzel for our Enchanted Castle, a Baby Bear and Goldilocks for the Three Bear's House, the third Little Pig, the Merry Miller and his Mice Band, Prince Charming, Cinderella and her Prince and her Pumpkin Coach Driver, more children to keep the Old Woman in the Shoe busy, the School Marm and more. Our 2009 projects were exciting, too. We created an a"mazing" new "The Enchanted Forest Pine Tree Maze." 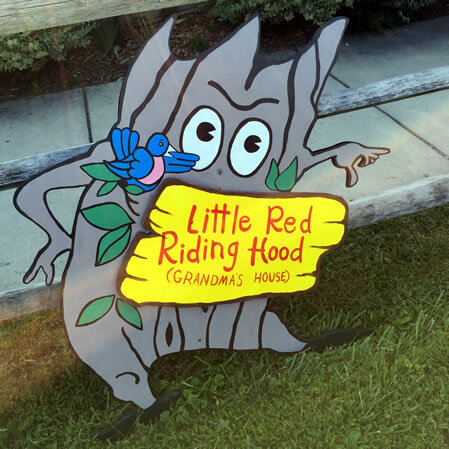 This is a fun maze in our 1 ¼ acre pine tree forest filled with twists and turns and characters and attractions from the Enchanted Forest. When you entered the Maze you could find Hickory Dickory Dock, Little Boy Blue, Peter, Peter Pumpkin Eater's wife, Hansel and Gretel and Little Red Riding Hood. To enhance your adventure in the Maze you could use our "Maze Guide and Activity Book" to search for and find all the highlights in the Maze. 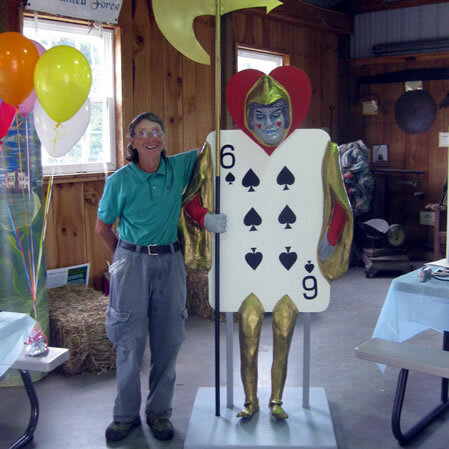 The Card Guard had been very generously donated to the farm by Bob Bretz of Beltsville. Bob has continued to surprise us with donated items he purchased on our behalf, including a salt and pepper shaker set, a souvenir plate and a pennant, among many others. Thanks very much to Bob for his generosity. We spent most of our time restoring and maintaining all of the attractions, characters and buildings we are now responsible for. 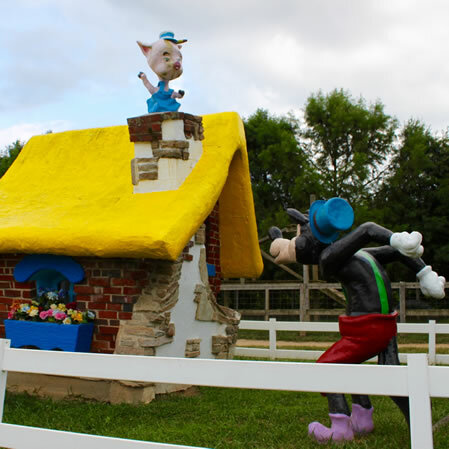 We fiberglassed the roof of the 3 Pig's Brick House and did lots and lots of painting. In 2013 George Miller and his crew were able to move 35 feet of the 50-foot slide from Mt Vesuvius and build a "mountain" at the farm to house it. Robinson Crusoe moved in below the mountain. Also in 2013 the seven dwarfs joined the children as they mine the enriched ore at the gem mine flumes at the farm. We trimmed all of the trees in the "Maze" and now it is not so much like a maze. We have renamed the "Maze" as "The Enchanted Pine Tree Forest." It is still a wonderful place to explore, still filled with many Enchanted Forest attractions and a wonderfully cool place to visit during the hot summer days. Mark Cline fiberglassed the roof of the 3 Bear's House on the hottest day of the summer of 2014. We thought we were finished with moving attractions from the Enchanted Forest to the farm when we were approached by Kimco Realty Co. to see if we wanted the white Entrance Castle. Of course, we said "YES"!!! The castle move took place on June 9, 2015. Kimco Realty and Meckley Services managed the major effort to take down and move parts of the Castle structure to our farm. George Miller and his crew worked all summer to rebuild the Castle at the entrance to our Enchanted Pine Tree Forest. We also have the Enchanted Forest Storybook entrance sign which we erected next to the Castle. George Miller and his crew did an amazing job of moving and rebuilding the Castle and putting the Storybook sign in place. He is a master builder and engineer and his entire crew worked hard and long to get the job done on time. In the meantime, Mark Cline of Enchanted Castle Studios completed major renovations for us. He fiberglassed the Easter Egg and the Sombrero, repaired the 3 Men in a Tub, the Dish and the Spoon and the leaves and bean pods on the Jack's Beanstalk. He built a cover for our Cavalry Wagon and did other repairs too numerous to mention. Clark's Elioak Farm's great staff and our wonderful volunteers were very busy as well. We repaired, primed and painted the Easter Egg, Mother Goose, the Rainbow Slide, Little Toot, Humpty Dumpty, Jack & Jill, the School Marm, the Birthday Cake, the Spider, The Old Woman's Shoe, the Merry Miller's House, Cinderella's Pumpkin Coach and the Mice, the candy canes, the mushrooms and flowers, Willie the Whale, the giant Sombrero, the Castle Store, the Giant at the top of the Beanstalk, the Gingerbread House, Little Red Riding Hood's Grandmother's House and Papa Bear. That's a lot of paint . . . A special thank you to Clark's ACE Hardware for donating the paint for many years to keep all the attractions bright and alive with color!!! We topped off all that hard work with a wonderful 60th Birthday Celebration on August 15-16, 2016. 39 local artists painted 52 amazing pictures of all the Enchanted Forest attractions. On August 13th Steve Wecker from the Iron Bridge Restaurant, our neighbor, prepared and served a lavish reception in their honor. 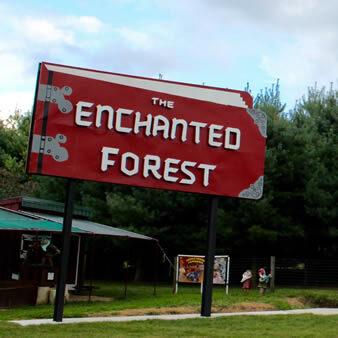 On Saturday August 15, Former State Senator Jim Robey lead our festivities and Howard County Executive Allan Kittleman joined us for a ribbon-cutting for the newly-restored Enchanted Forest Castle. We also hosted many Harrison family members and former Enchanted Forest employees at our 8th Annual Enchanted Forest Employee Reunion that same day. We were excited to unveil Mark Mark Cline's generous donation to the new Castle - our very own Ole King Cole. It was an amazing year for our farm and for the Enchanted Forest. What a great way to celebrate the 60th Birthday!!! Without a lot of help this would never have happened! Shop at our Castle Store. We have a history of the Enchanted Forest and reproductions of original Enchanted Forest books for sale. We also have tote bags, wine tote bags, key chains, magnets and postcards. Click HERE to see our special books and gifts for online purchase. See our gallery of Enchanted Forest photos, showing the Enchanted Forest structures and their move and restoration since 2004.
with input from the Harrision family and former Enchanted Forest employees and visitors. City), as well as Amazon.com and local bookstores.